In my previous post on configuring ASP.NET Core applications in Service Fabric using configuration packages, per environment overrides and a custom configuration provider I gave an example of how you could set a correct web host environment which allows you to adjust configuration and behavior of various components based on the current environment (staging, production, etc). While everything from that post still stands there is a better way to set host environment as code packages also support environment variables which are set for the host process and which can be overwritten with per-environment values similar to configuration packages. And finally define the environment parameter in the application manifest and provide its values in per-environment settings files. You don't need to manually extract this setting from the configuration and provide it to WebHostBuilder anymore as it will be extracted from environment variables by the framework. 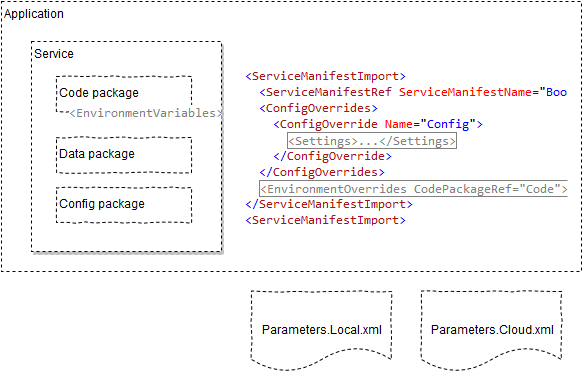 AddServiceFabricConfiguration is the extension that adds a custom configuration provider that reads from Service Fabric configuration packages as explained in the previous post.